Need a florist to send gorgeous flowers from the UK to Sydney, Australia? Pure Flowers is here to help! We delivergorgeous blooms from our award-winning florist anywhere in Sydney. Place your order by 11am weekdays and 9am Saturdays for same day delivery. Order online or call our flower shop on +612 9427 8214. Sending flowers from the UK to Sydney, Australia? Pure Flowers is here to help you send gorgeous flowers internationally. We hand-select our favourite fresh blooms from the Sydney Flower Market and use them to create stunning hand-tied bouquets, luxe arrangements and pretty posies. 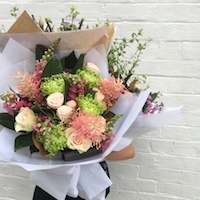 Whatever the occasion, we can deliver gorgeous fresh flowers from our award-winning flower shop to anywhere in Sydney. Place your order by 11am weekdays and 9am Saturdays, Sydney time, for same day delivery. Ordering is easy – buy online or call + 612 9427 8214. We deliver flowers from our florist to Sydney, North Sydney and across Sydney.